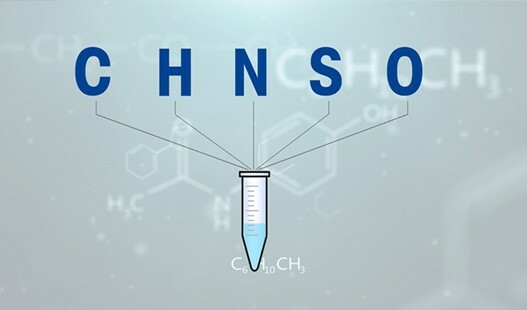 CHNSO elemental analysis, also known as organic elemental analysis or elemental microanalysis, determines the amounts of Carbon (C), Hydrogen (H), Nitrogen (N), Sulfur (S) and Oxygen (O) present in a sample. It is a reliable and cost-effective technique used to assess the purity and chemical composition of compounds and can be used on a wide range of different sample types including solid, liquid, volatile and viscous substances. Knowing the composition of the organic elements also helps analysts to determine the structure of the sample substance. The chemical characterization of organic compounds is used in research as well as for quality control (QC). Elemental analysis is a highly reliable analytical technique that is used in a wide range of applications across many different industries (see below). The most common technique of CHNSO elemental analysis is based on the combustion of the sample. This can be performed in a dedicated instrument known as an Elemental Analyzer. Upon combustion, the sample generates uniform compound gases of the elements C, H, N and S. These combustion products (e.g. CO2, H2O, NO2, etc.) are measured using gas chromatography and thus the ratio of the elements in the original sample is determined. C, H, N and S can all be determined simultaneously whereas O may be analyzed in a second step by pyrolysis. Organic elemental analysis requires relatively small sample weights. The actual sample weights vary according to the nature of the substance, the detection limits, the level of accuracy required and the type of elemental analyzer used. As the final amounts of each element are typically given as a percentage of the original sample weight, it is critical that the sample is weighed accurately. Due to the very small sample size, a highly accurate microbalance is recommended. Determination of composition, structure and purity of organic chemicals in pharmaceutical products both in R&D and in manufacturing. Determination of organic compounds in a wide variety of materials to assure the characteristics and behavior of the final product e.g. rubber, plastic, paper, metals. Examination of organic compounds in water, waste water, compost and particulate matter emissions. Scientific analysis of plant and soil samples (land and water-based applications). Determination of protein content as a measure of quality and for price setting. Also used to ensure compliance with food composition declarations. For reliable results, the samples must be free from contaminants and moisture. To prepare homogenous samples, it may be necessary to dry the substance under investigation to constant weight and finely grind it. For further details on the different methods for preparing the samples to be weighed and sample sizes, please see the Know-How section below. The following steps are presented as a guide to preparing samples for CHNSO analysis. Other methods of preparing such samples exist. Please refer to your SOP to ensure correct procedures. If no SOP exists, it is recommended that one is implemented to ensure consistency across your analyses. Prepare the required tools: a spatula, and two pairs of tweezers (straight and curved). You will also need a flat surface to work on. All equipment and surfaces to be used must be clean and dry. Ethanol is useful for cleaning, and can be left to dry naturally or wiped dry with a clean cloth. Prepare the tare containers. Depending on the sample type and the application, these may be very small tin or silver crucibles, or capsules. The tare containers must also be pre-cleaned and be thoroughly dry to avoid trace contamination. Place the empty tare container on an accurate microbalance and tare. Using the spatula, add the sample to the container until the pre-defined target weight range is reached. Using the tweezers, remove the container from the balance. Using the second pair of tweezers, pinch the top of the container to close it and fold over the edge twice to ensure the sample is securely sealed inside. Flatten the container and compress gently to make a ball or cube. Ensure that no sample is leaking. The sample container can now be transferred to the elemental analyzer. Ensure each container can be clearly identified. Microtitre plates with 96 wells are useful when handling multiple samples. Multiple samples may be introduced into the elemental analyzer in an automated process or manually introduced individually. 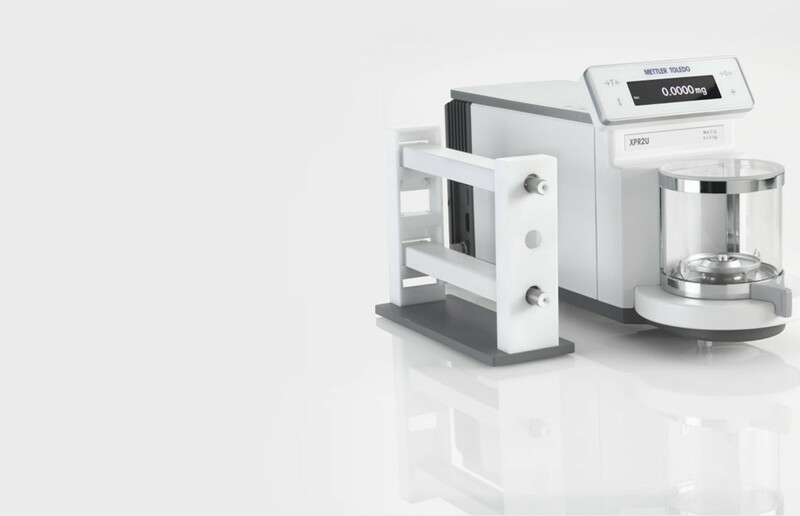 The elemental analyzer software calculates the amounts of the resultant gases as a percentage of the initial sample weight. The results, showing %C, %H, %N and %S, are given in a report. Samples must be dry and free from residual solvents to provide reliable results. Samples are usually freeze-dried or vacuum oven dried to constant weight, crushed, and homogenized using a mortar and pestle or electric mill. Preparation of samples is one of the most critical steps in the CHNSO analysis process. Homogeneity of the substance under investigation is an important consideration. For substances with high homogeneity, small sample amounts can be used, as this is sufficient to provide a true representation of the substance. A substance with low homogeneity requires larger samples to represent its true nature. Preparing the smallest possible sample amounts for CHNS/O analysis minimizes the total amount of substance required, reduces the amount of oxygen needed to combust the samples, and decreases waste. Organic elemental analysis is a highly sensitive procedure and therefore requires that samples are accurately weighed in order to determine the precise percentages of the elements C, H, N, S and O in the original sample. Sample sizes vary from application to application; the ideal sample weight is dependent on a variety of different factors including the type of sample, the detection limits of the elemental analyzer and the balance used to weigh the sample. In many cases, it is prudent to run several experiments to establish the range of the anticipated amounts of %C, %H, %N and %S prior to performing the actual analysis to help define the size of the initial sample. The table below provides an indication of sample size for various different elemental analyses. With very small sample sizes, it is crucial to choose a microbalance that can deliver accurate and reproducible results. This is even more important when the resultant percentages of C, H, N, or S in the original sample are expected to be low. When the sample size and the volumes of the resultant gases are low, measurement error in the resultant percentages can become significant. Hence this is why weighing your initial sample accurately is vital. The minimum weight of the balance is important as this specifies the smallest possible sample size that can be accurately weighed on that specific balance. Weighing samples below the minimum weight of the balance cannot be deemed to be accurate or reliable. However, it is also imperative to consider the safe weighing range of the balance, which is determined by applying a safety factor to the minimum weight. For a more detailed explanation of this topic please download the free guide “Safe Weighing Range Ensures Accurate Results”. CHNSO elemental analysis requires the samples under investigation to be weighed with a very high degree of precision. If you need any further information on selecting the right balance to meet the needs of your application or want to be sure that your current balance meets your accuracy requirements, our team of experts is here to help. Please do not hesitate to contact us. Laboratories performing CHNS(O) analyses handle hundreds of samples on a daily basis. Fast and accurate results are demanded for further processes. Laboratory analysts are under pressure to complete analyses as quickly as possible. Weighing out very small quantities into minuscule containers is fiddly and must be done with care. The skill of the analyst plays an important role in weighing out samples of a consistent size. As the final results of C, H, N and S content is given as a percentage of the initial sample weight, it is critical to weigh the sample accurately and record the weight correctly. Because many samples of the same substance will be analyzed, using small sample sizes minimizes substance use, reduces the amount of oxygen required for combustion, and decreases waste. A balance with a low minimum weight helps to minimize the amount of substance required. Preparing samples for CHNS(O) analysis is a time and labor-intensive process. Microbalances are very sensitive and can take several seconds to settle before releasing the weight result. Transcribing results takes time and is prone to human error, especially when weight results have 6 or 7 decimal places. Traceability of results is important to labs carrying out the analyses as well as to the end-customers. 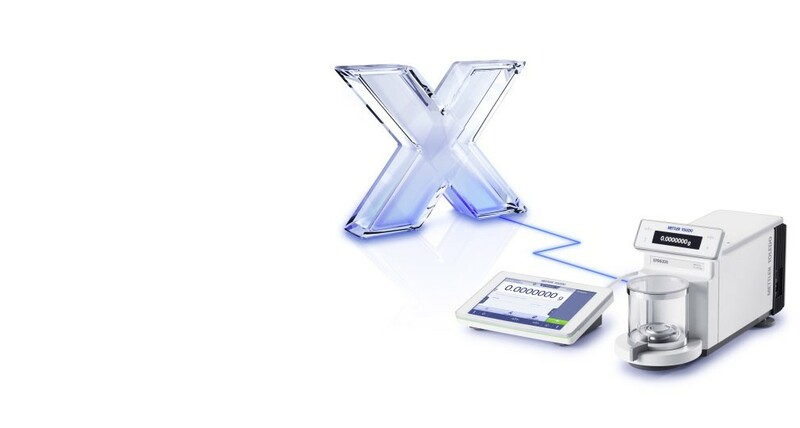 METTLER TOLEDO XPR microbalances offer unique accuracy and exceptionally low minimum weights. The weighing method, including target weight, tolerances, and number of samples can be saved on the balance and accessed directly from a shortcut on the balance display. Built-in quality assurance functions ensure weighing results meet defined tolerances and standards. METTLER TOLEDO microbalances have USP minimum weight values as low as 0.82 mg with readability of 0.001 mg enabling you to easily meet the accuracy requirements of CHNS(O) elemental analyses. Built-in quality assurance features such as StatusLight™, LevelControl and GWP Approved help ensure right-first-time results. Each weight result is saved on the built-in results notepad so there is no need to write results down by hand. The results can be printed out or transferred via the multiple connectivity options to an USB stick, PC or to another analytical instrument. This eliminates transcriptions errors and saves a significant amount of time. The Active Temperature Control (ATC) feature ensures stable balance performance, delivering results considerably faster than a standard microbalance. The automated draft shield doors help to maintain balance stability and makes weighing processes faster and more ergonomic. The compact footprint saves space, especially important when working in a fume cupboard. In addition, the secondary SmartView terminal above the weighing chamber has all the basic functions you need as you weigh-in, whilst the main terminal can placed wherever is most convenient, even outside the fume cupboard. Excellence Level microbalances are perfect for sample preparation for organic elemental analysis where measurement of very small quantities requires the use of a highly accurate microbalance. Watch the video and learn about the benefits of using METTLER TOLEDO equipment for CHNS(O) elemental analysis. Connect your microbalance to LabX laboratory software and benefit from a complete data management system for your laboratory. 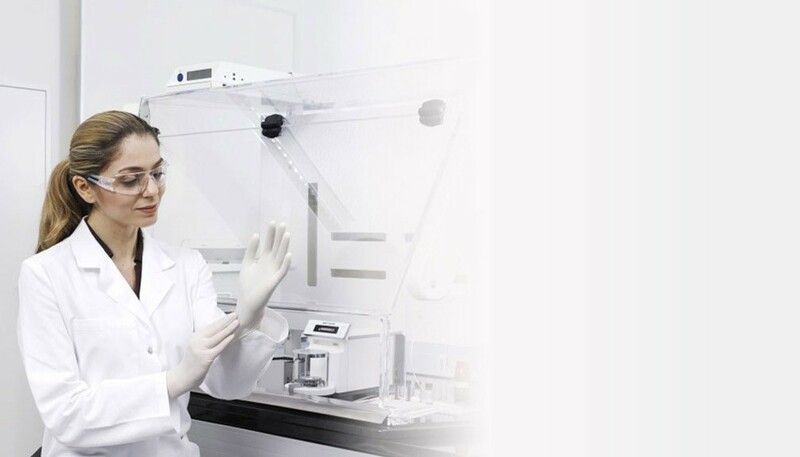 With central control of instruments, tasks and users, SOP guidance on the balance terminal, and elimination of manual transcription, LabX provides high security, increases efficiency and ensures full data integrity. You can connect one or more instruments to a single PC which can even be located outside your laboratory as the system works via your internal network. All administrative work is automated so your whole process can be digitalized. LabX integrates easily with other lab systems (LIMS, ELNs, LES, SAP). By implementing your SOP in LabX, analysts receive step-by-step instructions on the balance display. The analyst is guided through each step in the process, ensuring that the SOP is followed precisely by everyone. LabX takes care of all data and calculations automatically, supporting you to meet ALCOA+ data integrity requirements. There is no longer the need to manually document results and process information as all data is saved securely in a centralized database. Transcription errors are completely eliminated. What is safe weighing range? Why is it important to define it per balance and process? What's the use of a safety factor? Download guide. Your exact application will be developed according to your needs to guarantee adherence to your SOP. Can accuracy be improved by increasing the sample size? Wouldn't the larger sample produce bigger signals in the elemental analyzer? It is possible to increase the size of the sample but there are restrictions because the supply of oxygen for the combustion process is limited. For samples with a low carbon content (30-40%) that combust easily, the sample size can be increased to 10 mg. In CHNS analyses for quantifying unknown substances, it is advisable to use less than 3 mg. When it is not known how combustible the sample is, it is good practice to run two analyses at different weights (e.g. 1 mg and 3 mg). If combustion difficulties are encountered, the combustion conditions must be optimized. Macro elemental analyzers can take 1 g samples but this requires greater amounts of oxygen and larger reduction tubes. The amount of ash generated is also increased. Which balance is the best for CHNS analysis? Since the elements may only be present at levels of 10% or less, it is essential to use an accurate balance to correctly quantify the ratio of the elements in the sample. Typical sample sizes are of the order 2-5 mg. Furthermore, the ideal balance depends on the nature of the sample, the accuracy required and the elemental analyzer used. It's also worth noting that samples which are too large may have a negative impact on your elemental analyzer. METTLER TOLEDO's free GWP® Recommendation service can help you select the right balance according to your specific process accuracy requirements. The service can also be used to determine if your existing balance is fit for purpose. How can I find out what the safe weighing range of my balance for organic elemental analysis is? The safe weighing range of your balance defines an upper and lower limit for weighing in which the weighing results meet the accuracy requirements of your application. Weighing results can only be accurate and reliable if you are weighing in the safe weighing range. Whilst the upper limit is the capacity of the balance, the lower limit is determined from the balance minimum weight and the application of a safety factor in accordance with your accuracy requirements (process tolerances). Our free guide “Safe Weighing Range Ensures Accurate Results” explains the science behind safe weighing and describes how you can determine the safe weighing range of your balance in three easy steps. I do elemental analysis for our pharmaceutical products. Traceability is very important. How can I ensure it? XPR microbalances feature the unique results notepad. At the touch of a button, results are saved on the notepad and can be printed out or transferred to a PC. Connect your XPR microbalance to LabX software for the ultimate in data security. LabX saves all results and process information automatically in a secure, centralized database. Results are easily accessed at any time to print reports or for further analysis. How can I speed up the sample preparation process? Automated results recording and documentation significantly reduces the time taken to prepare samples. Consider connecting your balance to a printer or a PC to record the results electronically rather than writing results down by hand. Electronic data transfer eliminates transcription errors. By connecting your balance to LabX, all data and calculations will be taken care of automatically in the background. Step-by-step user guidance on the balance display will ensure you always know where you are in the sample preparation process. XPR microbalances have Active Temperature (ATC) which provides a stable environment for the weighing cell, meaning you get results delivered faster. Automated draft shield doors avoid the need to keep opening and closing the doors during weighing processes; this saves time and is much more ergonomic. It takes so long to write down all the weight values. Can you suggest a better solution? Recording results manually is time intensive and prone to error, especially when results may be 6 or 7 digits long. Consider connecting your balance to a printer or PC to record the results electronically rather than writing results down by hand. Electronic data transfer eliminates transcription errors. By connecting your balance to LabX, all data and calculations will be taken care of automatically in the background. I think I have an issue with electrostatic charging as my samples get scattered all over my balance. What can I do? Electrostatic charging is one of the largest hidden sources of weighing errors. When powders scatter over the balance, this is a strong indication that there is an issue with electrostatic charging. Other indications may be a balance doesn't settle or a results value that slowly drifts. To resolve the issue, place an ionizing unit next to your microbalance. Pass your containers and sample through the ionizer as you place them on the balance.